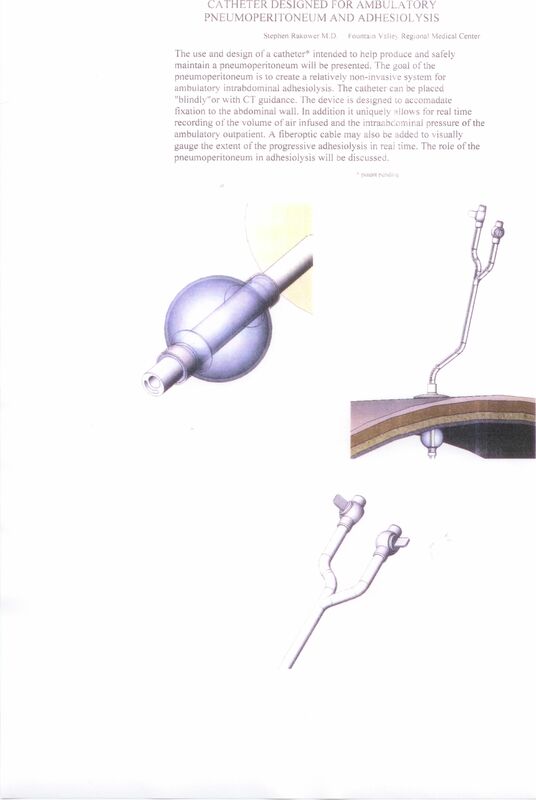 The use and design of a catheter* intended to help produce and safely maintain a pneumoperitoneum will be presented. The goal of the pneumoperitoneum is to create a relatively non-invasive system for ambulatory intrabdominal adhesiolysis. The catheter can be placed "blindly" or with CT guidance. The device is designed to accomadate fixation to the abdominal wall. In addition it uniquely allows for real time recording of the volume of air infused and the intraabdominal pressure of the ambulatory outpatient. A fiberoptic cable may also be added to visually gauge the extent of the progressive adhesiolysis in real time. The role of the pneumoperitoneum in adhesiolysis will be discussed.